Last November, Dr. John Northup of Citizens for Clean Air and Water (CCAW) told the Chatham County Commission that they are unique. "You are the only County Commission on the East or West coast that have yet to take action opposing the construction or expansion of a LNG facility." LNG stands for liquefied natural gas, which is the home heating fuel super-cooled and condensed into a liquid for importation into the U.S. from foreign suppliers. According to the EPA, one LNG supertanker, like the ones that ply the Savannah River a couple times a week, provides nearly 5 percent of the U.S. average daily demand for natural gas. It is that volume, in relation to the proximity of populated areas, that has opponents of onshore LNG facilities, like the one on Elba Island, concerned. "It's just not right to have a boat with 30 million gallons of liquefied natural gas cruising right by the northern end of Tybee Island," says Northup. 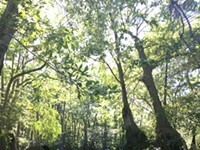 The handful of CCAW members might sound like lone voices in Savannah, where El Paso, the parent company for the Elba Island facility, is a venerable supporter of the community, donating large sums of money to local organizations and governments, as well as contributing millions of dollars to political campaigns. But outside of Chatham County, LNG opponents are numerous, influential and proving to be tenacious fighters against the multi-billion dollar natural gas industry and the federal agency that oversees it. The argument is simple and of nightmarish proportions: an accident or intentional attack on an LNG tanker or storage tank has the potential to unleash catastrophic damage. Rhode Island Attorney General Patrick Lynch refers to it as "apocalyptic possibilities." 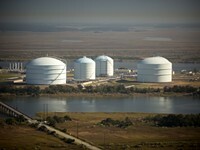 Since the Energy Policy Act of 2005, the federal government has given the the Federal Energy Regulatory Commission (FERC) the lead authority to permit the building and expansion of LNG terminals, like Elba Island, leaving little, if any, control to state and local governments as to where these facilities are constructed. But governors of other states like Oregon, New York, Massachusetts, Rhode Island and Maryland are speaking out. Not against LNG per se, but against siting LNG terminals in urban areas, where they say, neither adequate risk and safety assessments nor the need for the fuel is being demonstrated by either the natural gas industry or FERC. "Parts of our federal government are more concerned about the industry than about the people and our environment, says Rhode Island Attorney General, Patrick Lynch, who lead the fight against a LNG import facility in Providence-the only LNG terminal FERC has recommended against to date. It was Lynch's success in defeating LNG that lead Savannah citizen activist Patricia Jenkins to invite him to Chatham County. Jenkins became a member of CCAW after her elderly parents were evacuated from their home in the wake of the Powell Duffryn chemical tank explosion in 1995. She says that as bad as that accident was, leaking toxic hydrogen sulfide gas, which forced as many as 2,000 people to evacuate, sent hundreds to the hospital and closed a nearby elementary school, an Elba Island LNG accident would be hundreds of times worse. Lynch says that at the time his office was working the case against the Providence LNG terminal, terrorism expert Richard Clarke's book Against All Enemies had just come out, seemingly laying the threat on the table-LNG tankers are known terrorist targets. According to the report Clarke then wrote for Lynch, titled LNG in Urban Areas, terrorists have the intent and capability of executing an intentional breach on an urban LNG facility. "They failed in Providence not because of Attorney General Patrick Lynch," says Lynch, "but because he joined with community activists, he joined with environmentalists, he joined with cities and towns, he joined with water coordinators. We all cobbled together this broad network of support to say that this is dangerous and wrong." 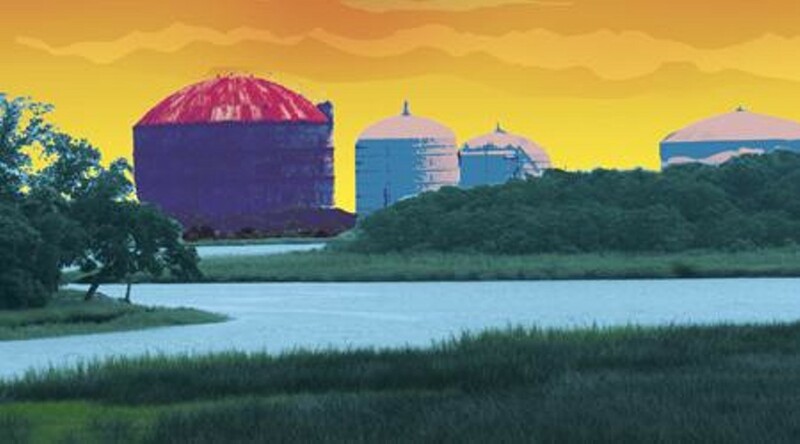 That was in 2005, and despite the natural gas industry's speculation that the Providence decision would have implications for future onshore terminals, it has not. Two years later, Elba Island's second expansion was approved by FERC. There was no state-level opposition and aside from a couple of environmental groups, and landowner's opposing the construction of the 190-mile pipeline, there was no local resistance. The message was clear: the LNG industry was safe from opposition in Georgia. When the latest Elba Island expansion is complete, it will be the largest terminal on the East Coast. That means an increase in the number of LNG supertankers traversing the Savannah River, in some places coming within a half-mile of populated neighborhoods, nursing homes and historic sites. Port traffic will shut down more frequently, while the tankers offload into the storage tanks. Three of those tanks were built in the 1970s, before modern safety standards were enacted, similar to the ones in Providence that Lynch calls "antiquated," and ultimately were cited by FERC as the reason the terminal was not permitted. The new safety standards apply only to facilities designed after 2000, says FERC. Older facilities need only meet the standards in place at the time they were constructed. "I've always had my concern about these tanks being up to current standards," says Jenkins. "The expansion should be stopped and the facility moved offshore." Jenkins, an avid researcher on LNG, disseminates information by email to members of CCAW: reports by the Government Accountability Office (GAO) of the risks of "cascading failures"-the domino effect of one tank's breach spreading to another, either on a supertanker or storage tanks on the ground. Then there is the government-funded Sandia report, concluding that a liquefied natural gas spill, upon hitting air, would turn into a vapor cloud capable of traveling up to seven miles. If conditions are right, the vapor cloud has the energy to detonate, like a bomb, if ignited. CCAW included much of this evidence in their presentation and report to the County Commission. The commission voted unanimously to look into the threats of LNG, and Chairman Pete Liakakis promised that "our legal staff will put things together right away." That was ten months ago, and the Citizens for Clean Air and Water have yet to hear from the commission. Liakakis says he doesn't know what happened with communication back to CCAW, but his staff did look into it as he promised. "El Paso has hired the largest law firm in the state, and if we were to file an action to close them down, we're not going to win. We're going to lose," says Liakakis. CCAW is no stranger to Goliath. Dr. Northup and current president of the organization, Clete Bergen, remember all too well the day when Savannah smelled like an old sneaker full of rotten eggs. They were lone voices in a town that equated its stink to the smell of money, but ultimately International Paper capitulated, installing millions of dollars worth of scrubbers and pollution controls. Their goal this time around-to move the Elba Island facility offshore-would cost hundreds of millions of dollars. But Lynch points out "You're dealing with incredibly deep pockets." As far as Lynch is concerned, "under the last administration that meant incredibly direct access." His outspoken nature has catapulted Lynch, a candidate in the Rhode Island gubernatorial race, to be a strong democratic contender, and has CCAW hoping that his visit to Savannah can ignite a similar fighting spirit in Georgia's politicians. "I can tell you what a few citizens can do, they can rise up and remind their leaders that they serve on their behalf," says Lynch. "It's a fight that is well worth it, particularly when there are other safer alternatives." The safety risks associated with LNG terminals have been debated for decades. A 1944 accident at one of the first LNG facilities in the country killed 128 people and initiated public fears about LNG. According to the Congressional Research Service, technology improvements and standards since the 1940s have made LNG facilities much safer, but serious hazards remain since LNG is inherently volatile and is shipped and stored in large quantities. A 2004 accident at an Algeria LNG terminal killed or injured over 100 people, and has added to the ongoing controversy over LNG safety. The Elba Island facility has never had an accident, but it has had several of what Citizens for Clean Air and Water call "embarrassing and potentially dangerous events." In June of 2006 a private sailboat dropped anchor at one of the facility's tanker slips, spending 6 hours there the day before a LNG supertanker was due to dock. It turned out not to be a nefarious vessel, but the point was made-security at Elba Island was lacking. The Coast Guard responded with a security zone around the slips. Yet, a 2007 report from the Government Accounting Office indicates that the Coast Guard has insufficient resources to meet its own self-imposed security standards. The other incident occurred four months earlier, when a LNG supertanker swung free from its mooring during offloading. The Savannah Morning News headline called it a "Near-miss," caused by the wake from a passing freighter. Judy Jennings, Conservation Chair of the Coastal Group Sierra Club, has been vocal about the location of the Elba Island facility, saying "it is not strategically located, being in the bottleneck of the river." Wrapping up his plea to the County Commission last year, Northrup said, "although some may consider the risk of a catastrophic explosion at Elba Island to be low, the potential consequences are so devastating, so enormous, so unthinkable no governmental body in any other port city of the east or west coast is tolerating the expansion of LNG in their community." CCAW realizes that before they can fight to move the Elba Island LNG facility offshore, they're first battle is to get the community to care. And that is proving to be harder than they had initially thought. The Public is invited to find out more about LNG and learn how Rhode Island defeated the expansion of a LNG terminal in their community. Desoto Hilton, September 3, 6 p.m.